Unfortunately, in many provinces of Afghanistan because of cultural poverty girls don’t go to school or when they reach seventh or eighth grade they often become engaged (to be married) and leave school. 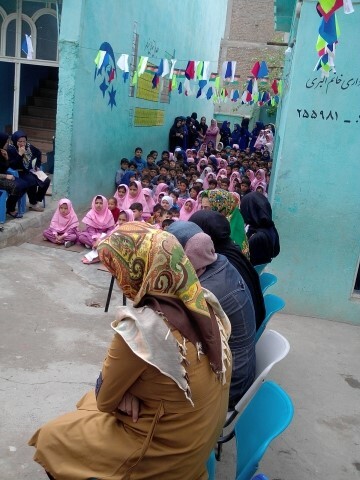 It is widely the norm in Afghanistan that women should stay home with the children because it is believed that literacy doesn’t benefit girls and young women; their duty is to be a housewife. Also, due to the lack of female teachers, girls after fifth grade are usually prevented by their families from attending school, because they believe, according to Islam, girls are not permitted to go to classes taught by men. Economics is another issue. It is thought a waste of money to spend money on girls, particularly on a girls’ education. Whereas, if money is spent on boys, the boys will be able to support the family as the parents get older. Only 40% of girls are currently attending primary school, only 6% are in secondary school. In 2015, 84% of women aged 15 and up and 51% of men have never attended school. Of the 70 private universities in Afghanistan – with over 200,000 students – only 18% are women compared to 82% men and only 15% of university lecturers are women. It is within this context that Women Education for a Better Tomorrow works to challenge these egregious numbers. Laboring in a seemingly uphill battle, they hold workshops in schools with teachers and parents about granting girls access to go to school. And if the girls’ absence is due to economic reasons, they support families by buying stationary and school supplies for girls. They also train schools’ female teachers the skills to teach beyond grade 5. (Of the 364 districts in Afghanistan, female teachers are only present in 200 and are overwhelmingly not present in rural areas.) In the near future, the organization plans to train more female teachers for remote areas and plans to set up teacher training according to Islam in order to increase fair and equitable education access. The scope and necessity of work like that of Women Education for a Better Tomorrow is underlined by the dire statistics above. And it is the change-makers, like Women Education for a Better Tomorrow, who are the grassroots advocates that Women Thrive has the pleasure of working with and supporting all around the world. Women Thrive Alliance is a global network of 250 grassroots women's rights organizations in 50 countries. These organizations are led by local change-makers who believe that women and girls should live free from violence, enjoy quality education, and achieve economic empowerment. They believe that by challenging the status quo, they can achieve greater equality for all. In DC, we fight to make sure that the United States is held accountable to its commitment to achieve gender equality worldwide. Around the world, we support local women's rights organizations to advocate for change and ensure that women, girls, men and boys enjoy equal rights and opportunities. Want to support the gender equality advocacy of Women Education for a Better Tomorrow and 250 organizations like them? Consider a donation to Women Thrive Alliance today!